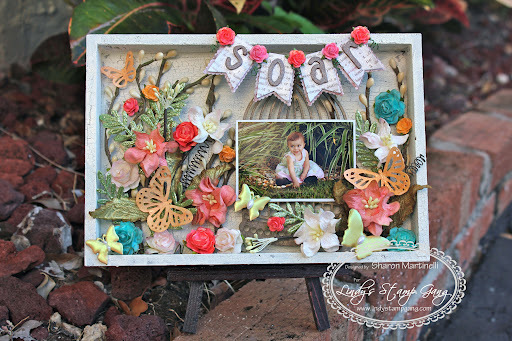 I waned to share a small shadow box I created for the Lindy’s Stamp Gang booth at CHA this winter. It was one of the projects I completed for the booth and I just love how it turned out. 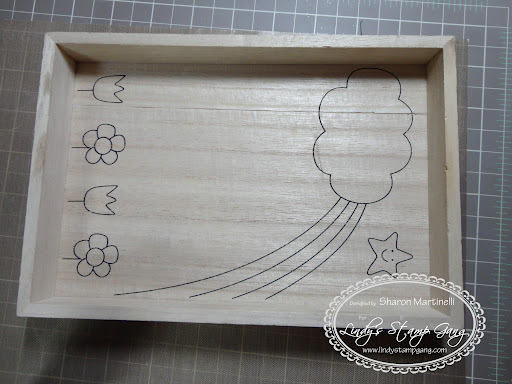 There was a lot I did to this box, and I love how it came out…. I had a picture of a garden on my mind, and I think I achieved it. What do you think? First I prepped the box with guesso. After that dried, I applied a coat of brown acrylic paint. when that dried, I put a coat of crackle medium, and then some ivory acrylic paint, all to achieve the crackle finish you can see all over the box. After all that dried, I sprayed the entire box with Creme Brulee Cream Starburst Stain for some shimmer. 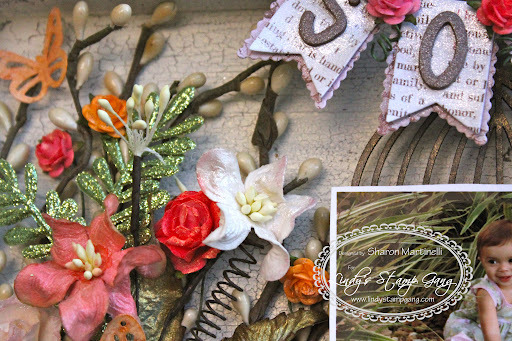 I used one of My Favorite Thing’s banner dies, and cut out the banner from designer paper by Colorbok (Flea Market Collection). I then sprayed the banner pieces with Scintilating Silver Glitz Spritz, and afterwards added to the banner some Maya Road chipboard letters, which I sprayed with Cadbury Milk Chocolate Startburst Stain. In between each banner piece I added some tiny mulberry paper roses which I sprayed with different Starburst Stains: Cotton Candy Pink and Alpine Ice Gold. Afterwards, I embossed the tips of these roses with some Lindy’s Stamp Gang embossing powder in the color Hibiscus Rose Orange. LOVE embossing the tips of the petals of my flowers! I also used some Lindy’s Stamp Gang butterfly charm pieces, which I embossed with Dandelion Yellow embossing powder, and finished off with some white pearls on their centers. I punched some butterflies out of cardstock using two different Martha Stewart butterfly punches. I then sprayed the butterflies with Icy Primrose Gold Starburst Stain, and sprinkled some embossing powder in the color Byzantine Bronze, just to add more texture and shimmer to them. 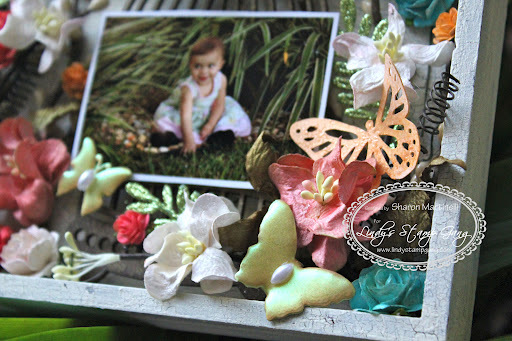 I used some glittered green sprays, as well as some vintage white bud sprays in the backgrouns, which I got at my local craft store. Behind the picture of my Emily I used a Kaiser Craft wood birdcage piece, which I sprayed with my Starburst Stain in the color Golden Lump of Coal. The stain gave it just the right touch of shimmer. I filled in the rest of the box with different sized mulberry roses which I colored using my Starburst Stains in the following colors: Alpine Ice Rose, Tiffany’s Blue, Wild Honey Suckle Coral and Scintilating Silver. The wood stand that holds the box was also purchased at the dollar store. Can you believe it? 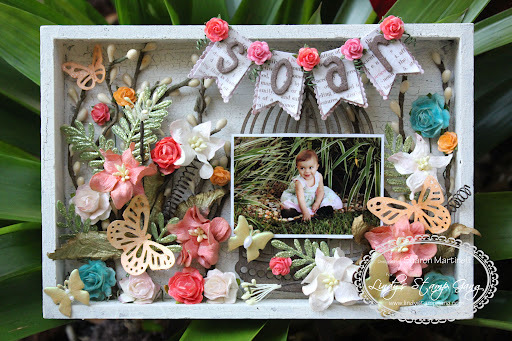 I hope you enjoyed this project and were inspired to create with Lindy’s Stamp Gang Products. Until next time!